Draba provides some of Texas' earliest spring foliage. ﻿﻿﻿﻿﻿﻿﻿﻿During the cool winter month of February, my family enjoys walking and biking around our neighborhood retention ponds. When the ponds are full, our girls are attracted to an exposed chalk limestone glade area that fractures with small disk-like rocks, perfect for skipping across the pond. The early draba flowers peep out from the cracks in the limestone rock and open, barren clay soils adjacent to the pond, brightening our winter afternoon. This charismatic little plant excites my botanical thirst as one of the early signs that spring flora is upon us. The genus Draba is in the mustard family Brassicaceae (Cruciferae) and contains 380 species distributed through northern temperate and boreal areas and the mountains of South America. Draba is the Greek name for “acrid,” due to the bitter taste and smell of mustards. Five species of drabas occur in Texas in bare spots in prairies, rocky glades, open woods and roadsides on clay, sand and gravelly soils. Drabas are commonly known as “whitlow-grasses” even though they are not related to grasses. Texas species include both annuals and perennials, and form basal clusters of leaves, which are thick, sometimes toothed, and coated with hairs. Drabas bolt with one or more erect stems that may be up to 16 inches tall. Each hairy stem bears an inflorescence (complete flower head of a plant including stems, stalks, bracts and flowers) with white flowers for four of the Texas species and yellow flowers for the rarer Standley’s draba. Drabas flower and fruit primarily from early February through April with the exception of Standley’s draba, which flowers June through October. Short-pod draba (Draba brachycarpa) is white-flowered and distributed from East Texas west through the Blackland Prairie to the Edwards Plateau. Short-pod draba occurs in woods, roadsides and open grounds on mostly sandy soils. Short-pod draba flowers from February through March. Wedge-leaf draba (Draba cuneifolia) is one of the most widely distributed mustards in Texas. 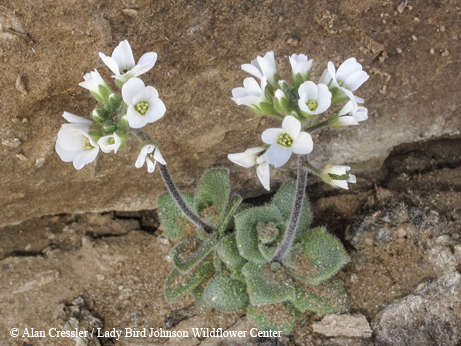 Found on sandy and gravelly soils throughout much of Texas, the wedge-leaf draba is white-flowered and blooms February through April. Broad-fruited draba (Draba platycarpa) is white-flowered and distributed from the Blackland Prairie west to the Rolling Plains and Edwards Plateau. Broad-fruited draba occurs in rocky slopes or bare spots in prairies on sandy or calcareous clay and flowers March through April. Carolina draba (Draba reptans) is distributed from the Blackland Prairie west to the High Plains. Carolina draba occurs in open woods, fields and roadsides on sandy or rocky soils and flowers February through March. Standley’s draba (Draba standleyi) is globally rare, yellow-flowered and a perennial. The plant occurs in sparely vegetated igneous boulders in pine-oak-juniper woodlands. Keep an eye out for these tiny mustards, early harbingers of spring.